International Monetary Systems (OTCBB: INLM), a worldwide leader in business-to-business barter services, reported the roll-out of its proprietary barter commerce management software, Trade Network Tracking System (TNT), will begin in June. The TNT System lies at the heart of IMS�s day-to-day operations; handling the processing of real-time trade dollar transactions, managing client information and transaction histories, internal reporting, business intelligence, and customer relationship management. This new platform enables IMS to rapidly implement new features, improve usability, take advantage of database, internet, and e-mail connectivity, and facilitate tighter integration with the firm�s web site. It also benefits from the core functionality and established best practices of the company�s previous system, TradeWorks, for which IMS purchased the source code in 2007. Nathan Alpert, IMS chief software architect, stressed, �The impact of this progression cannot be (over)stated. The TNT System will completely revolutionize the core of IMS� operations. It will drastically improve efficiency and reduce overhead by streamlining or completely automating time-consuming tasks. Our brokers will be able to manage significantly more accounts, efficiently connect buyers with sellers, and capitalize on new trade opportunities found by the trade analysis and data mining capabilities of the software. Don Mardak, IMS CEO, added, �The TNT System will not only provide our members and our team with all the advantages of today�s technology, it also positions IMS to capitalize on the constantly evolving technology of tomorrow. This evolution is indicative of IMS� role within the barter industry to lead in the sound management of a secondary economy based on the products and services of our member businesses. For more information see www.imsbarter.com. ITEX Corporation (OTCBB:ITEX), a leading marketplace for cashless business transactions in North America, announced today it has become a regional sponsor of the New York City chapter of the Entrepreneurs� Organization (EO). Sponsors receive an introduction to the Chapter�s membership, access to all events, special placement on the Chapter�s web site, and ongoing recognition in monthly newsletters. �John Castoro, the top ITEX franchisee in the U.S., and I met at the New York Restaurant Show last year,� reflected Steve Savad, NYC chapter director and founder of Restaurant.com. �I thought the business model of a trading community was intriguing and a great fit for many of the EO member companies. Among the missions of EO is to source value-added partners that provide offerings that can help our member companies better succeed. �We look forward to working closely with Steve Savad and the EO New York City Chapter,� revealed Steven White, Chairman and CEO of ITEX. �The goal is to register all the businesses in that chapter, and we are off to a great start. Already nearly a dozen EO New York businesses have completed their registration, including Go Green Expo, Fuel Outdoor, Advantage, and 888 Red Light. The quality of these new members is exceptional. �Since cross marketing to business organizations is a great way to grow our membership base, we continue to selectively search for high quality partnerships and relationships throughout the country to promote ITEX services to the business community,� White pointed out. For more information visit http://www.itex.com. The IRTA European Chapter will be celebrating its 10th year anniversary this September at IRTA�s 29th Annual International Convention at the Westgate River Ranch Resort outside Orlando, Florida, from September 22 to 25, 2008. IRTA Hall of Fame member Paul Suplizio founded IRTA�s European Chapter when he recognized the growth of barter and trade in the European market. Since the European Chapter�s inception, member barter exchanges have included representatives from Belgium, England, Scotland, Germany, Italy, the Netherlands, Poland, Slovakia, and Turkey. �The European Chapter continues to grow and plays an important role in IRTA,� confirmed Executive Director Ron Whitney. �We just had a terrific Euro Conference in Poland where we created a whole new slate of exciting initiatives, and voted in a new group of Euro officers.� The new European officer�s slate is Richard Logie (president), Rob Van Hilten (vice president), Dariusz Brzozowiec (treasurer), and Reiner Husemann (secretary). 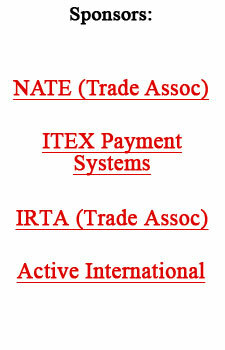 For more information on IRTA go to www.irta.com, or call Ron Whitney at 757-393-2292.
International Monetary Systems (OTCBB:INLM), a worldwide leader in business-to-business barter services, has scheduled its annual shareholder meeting for the afternoon of Tuesday, June 17, at the Sheraton Milwaukee Brookfield Hotel. Shareholders of record on May 1, 2008, will be eligible to re-elect three directors, to ratify Webb & Company as the company�s auditors of its 2008 financial statements, and to vote on any other business that may be presented. Don Mardak, CEO of IMS, stated: �This meeting, although routine in many ways, will also include a segment that highlights the team and tools that IMS has invested in over recent months. We are proud to present the people and the work they�ve accomplished on behalf of IMS. It�s not unusual for 70 to 80 percent of a firm�s cash business to come from 10 to 20 percent of its customers�often referred to as �A� customers. Yet don�t confuse your �A� customers as being only cash customers. What is an �A� customer for your firm? Each business needs to develop a specific profile of its best and most profitable customer. High volume is a major ranking criterion. But be prepared to downgrade the slow-paying big spender who consistently demands extra discounts and services. Take another look at your customer base. How many A�s can you identify? Where are your potential A�s? What strategies can be developed to keep them coming to you? And what can you be doing to secure additional candidates? An ideal �A� customer is one who makes the most significant contributions to your bottomline. This is where your barter customers contribute heavily because their trade business is incremental business�extra business that can be the most profitable. It�s often the frosting-on-the-cake, so to speak. Sometimes this customer receives a lower level of service because he or she is not demanding, and the business is considered �only trade.� Yet, when properly analyzed, their business may place them up there in the �A� category, because they contribute heavily to your bottomline profits. So bring your employees (or team members) together and see how close they can come to designing the perfect �A� customer. Write down all the criteria that is important to your company�s future. Use your imagination to develop this mythical entity, and you will make some interesting discoveries. Plus you will develop a benchmark that allows you to see all your customers, whether cash or trade, in a new way. Then focus your marketing efforts where they will do the most good...stabilizing and increasing your customer base. Sino Fibre Communications (OTCBB:SFBE), a broadband value-added internet services provider in China, has signed an agreement with Shenzhen Bank-Union EPS Financial Services (www.ebankunion.com) to add online payment processing services to its barter exchange platform. This capability will enhance the online barter trading and settlement system for the B-to-B e-commerce services provided to the 4.5 million medium and small private enterprises from the company�s joint venture company with CAMSE. For more information about Sino Fibre Communications visit www.sinofibre.com.